talech, in partnership with BOIPA, provides a feature rich tablet based EPOS system optimised for the Retail and Hospitality sectors. Whether you’re a small independent outlet or a larger retail chain of franchise, talech provides all you need to run your business better. We’ve combined all the essential elements for you including card processing with BOIPA and talech’s intuitive POS solution with compatible tablet and printer/scanner. When you use the talech POS solution your data is stored in the cloud. This means you can confidently run your business anytime, anywhere you have an internet connection. Get set up quickly. With a few taps you can take orders, accept payments, and manage your inventory. 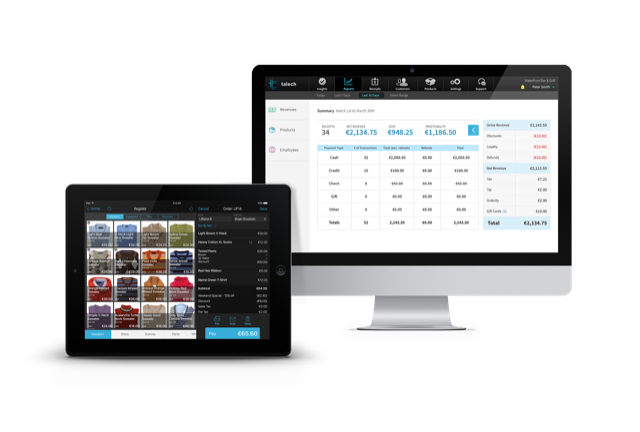 The talech POS solution provides real-time sales, inventory management, customer, and staffing metric reports across multiple locations. The talech POS solution offers gift card and customer loyalty modules to attract new customers and retain existing ones. Your talech solution with BOIPA supports contactless payments as well as Google and Apple Pay. talech will grow with your business needs. As those needs change, you can add or remove peripheral hardware and licenses with ease. talech is supported by your local BOIPA field engineers and the dedicated Irish based talech customer care team. We have developed a number of simple hardware bundles to get you started. Simple and easy set-up, simple and easy pricing. Monthly fees start at €49.99 on the standard package for one EPOS license.